BANGKOK — A court in Thailand granted bail Thursday to 15 pro-democracy activists who were arrested earlier this week during a protest against military rule at which several thousand police were deployed. Krisadang Nutjaras, a lawyer for the student activists, told reporters they applied for bail after the court agreed to a police request for a further 12 days' detention. It was set at 100,000 baht ($3,100) for each person, he said. Police have charged each activist with several offenses, including violating a ban on political assembly and obstructing officials. They are required to report back to authorities in eight days and their bail is conditional on not participating in illegal political demonstrations. The activists, who were arrested Tuesday at a protest marking the anniversary of a 2014 military coup and calling for elections this year, were applauded by supporters as they walked out of the Bangkok Criminal Court complex. "Only barbaric countries say elections are illegal," a 25-year-old protest leader, Rangsiman Rome, said outside the court. "Thank you everyone for coming. Today will not be the last day for our fight." Documents that police submitted to the court argued that bail should be denied because of the seriousness of the offenses. They also said they needed more time to complete their investigation. 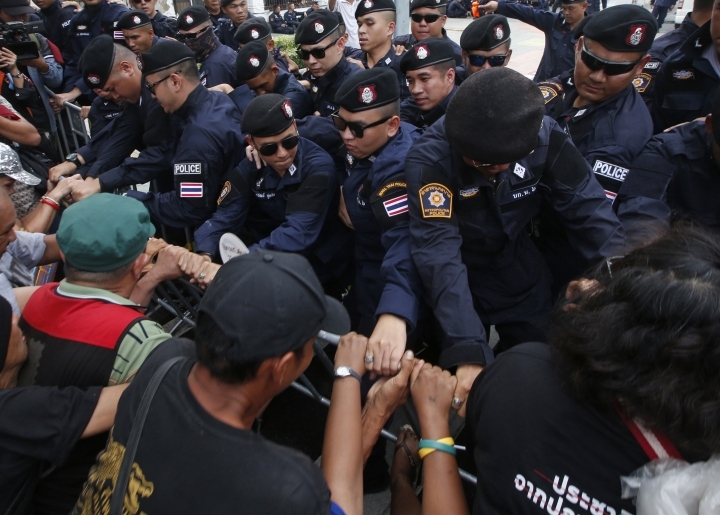 Krisadang accused police of filing "excessive charges" against the protesters. He also criticized the court for refusing to hear counterarguments when it considered the request for detention to be extended. "We never got a chance to present our reasoning to show the court that the kids are people who love democracy," he said. "If in our country people use their rights to ask for democracy and get arrested and deemed traitors that cause havoc, there is not much hope left." Tuesday's protest drew about 200 demonstrators but was met with an overwhelming security response. More than 3,000 officers were deployed to prevent the activists from marching from a Bangkok university campus to Government House. The protesters, mainly middle-aged and elderly people led by a core of student activists, have been holding regular rallies for the last few months, calling for the junta to resign. Political gatherings of five or more people are banned by the military government.